In an effort to catch up on the stack of to-be-reviewed books on the corner of my desk, I've got a couple of mini-reviews today. 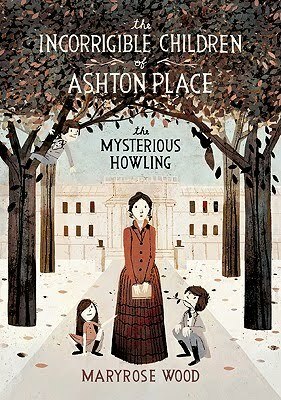 The Mysterious Howling (The Incorrigible Children of Ashton Place #1) by Maryrose Wood. (Grades 4-7.) Balzer + Bray, March 2010. Review copy provided by publisher. Miss Penelope Lumley, new graduate of the Swanburne Academy for Poor Bright Females, has found herself a job as governess to the children at Ashton Place. The job seems too good to be true - it's offered to Penelope after only the briefest of interviews and the salary is more than generous... But it turns out that there's a reason for that. The three children Penelope will look after... have been raised by wolves. Ohh, I really liked this book. It's tongue-in-cheek and Snicket-esque and great fun all around. I was chuckling along and really appreciating the rich writing the entire time. I'm happy to know that this is the first of what I hope will be many books about The Incorrigibles! Hand it to fans of Lemony Snicket or Lois Lowry's The Willoughbys. Rules of Attraction by Simone Elkeles. (Grades 10+) Bloomsbury Teen, April 2010. Reviewed from ARC provided by publisher. When Latino bad boy Carlos Fuentes is sent to Colorado from Mexico, he expects to continue getting into trouble and taking care of himself the way he's used to. What he doesn't expect is Kiara and how he can't stop thinking about her. Kiara is straight A's, hiking, and babysitting her younger brother on Saturday nights. When she volunteers to show the new kid Carlos around school, she doesn't expect him to be so smoldering. Even though she knows better, she can't help falling for him. Basically, if you read Perfect Chemistry, you know what you're getting into here. Which is half the fun. :) As I was reading it, I bemoaned the shallow characters, the predictable plot... but when I wasn't reading it... I wished I was reading it. And books like that don't come along every day. So let yourself sink into this one. Hand it to teens looking for a steamy un-put-downable romance or fans of the first book. AND. I ended up with two copies of Rules of Attraction, so I am going to give one away to one lucky reader! All you have to do is fill out the form below. I want to get this out to the winner ASAP, so this giveaway will last through this weekend only! Enter by 7:00am Monday morning (March 29) to be considered! Contest is open to everyone worldwide. ETA (March 29): The contest is now closed. Thanks to all who entered!